The year is 1989. Japan’s economy is at an all-time high. This means that automakers have more means and resources to experiment and create revolutionary, outlandish vehicles. Toyota has created a new luxury brand, Lexus, to go head-on with the Germans. Mazda revives the classic British roadster concept with its MX-5. And Nissan brings back the legendary GT-R from the dead. The Japanese car industry has finally entered its Golden Age. The R32 GT-R is an important milestone for the Yokohama-based car company. It symbolises the return of a legendary racing brand - one that has been synonymous with victory from 1969 to 1972 - after 16 years of absence. Nissan spared no expense in ensuring that the GT-R was the king on the racing circuit. After all, they used the mighty Porsche 959 supercar as its benchmark. The Skyline GT-R was given the very best that Nissan had to offer; twin ceramic turbochargers, an advanced all-wheel-drive system (ATTESA E-TS), and all-wheel-steering (HICAS), amongst others. The GT-R was a beast on the Nürburgring, decimating the production car lap record held by the Porsche 944 Turbo by over 20 seconds, setting a new standard of 8 minutes 20 seconds. It was simply unbeatable in all racing events it participated in, home and abroad. Locally, in the Group A All-Japan Touring Car Championship, it won all 29 races it participated in. In Australia, it crushed the competition in the Bathurst 1000 so badly, that they were soon banned. It was also there that the GT-R rightfully earned its nickname “Godzilla”. Now let us look at the 1/18 scale recreation of this Japanese national treasure, created by Kyosho. Immediately, you are attracted to the iconic blue-and-white Calsonic livery. 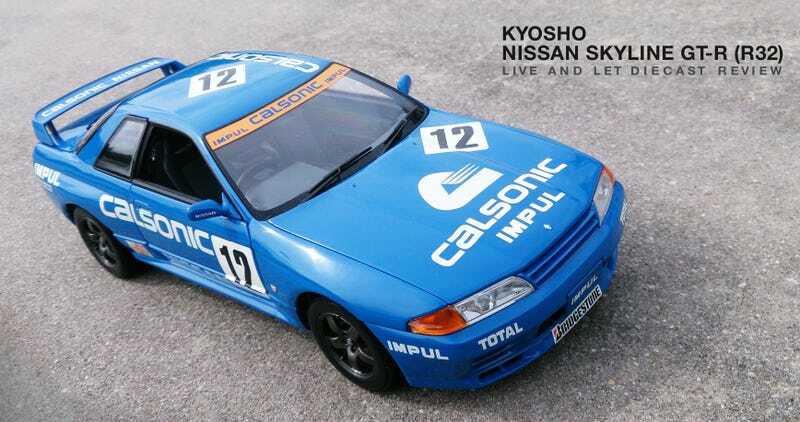 The Group A racing version of this Nissan sped to victory in the first and last of the four JTCC seasons, making it the most recognisable and iconic of the competing R32s. However, this model is not th e Group A car, but a standard road-going version. That means full carpeting, complete interior panels, and sensible tyres. The paintwork is smooth and beautiful, although the livery feels somewhat rough to the touch. The dimensions of the car have been recreated faithfully. The odd bulges and curves all around the R32 that contribute to its muscular profile are done perfectly. From all angles, the overall stance is correct and faithful to the actual car. The headlights have been crafted well, something that cannot be said for other manufacturers’ attempts (Autoart’s early attempt was flat-out wrong, and Jada’s was a joke). However, the black border found around the actual car’s headlights are missing here. It is not immediately noticeable, but you can sense that something is not quite right. The grilles are actual perforated mesh pieces. The front splitter is painted in the same shade as the rest of the body, imitating its Group A brother. The S badge on the bonnet is a photo-etched piece, adding a layer of realism to the model. The number plate is also sized correctly, although having it painted blue seems like an odd decision. Even the blue VIN plate at the back of the bay is readable and lifelike. From this angle, the wirings running alongside the panel can be clearly seen. Impressive attention to detail. The good news continue over at the side. The tyres are beefy and realistic. The gunmetal grey alloy wheels look good, especially with the Skyline emblem at the centre. The cross-drilled brake rotors are photo-etched metal and extremely realistic in appearance. The calipers are black with white Nissan letterings printed on the surface. Overall, an excellent effort by Kyosho. From this angle, we can further appreciate the details of the wheel and brake components. The side ‘GT’ badges just behind the front wheels are also photo-etched. The side profile is simply perfect. The contours of the body, general ride height, and small details all add up to make a realistic model. The only gripe that some might have is the lack of side windows. Personally I do not mind its absence. It makes it much easier to gain access to the wonderful interior, which I will cover later. The details just keep on coming at the rear. The rear light lenses are detailed and realistic. However, the signal indicators could have been a darker shade of orange. The Nissan and GT-R badges on the bootlid are also not as crisp as they could have been. There are towhooks at the lower half of the bumper, which is a pleasing detail. The metal exhaust tip also looks right at home, without looking too tacky or oversized. The bootlid opens with slight resistance, and is supported by two dogleg hinges. The boot itself is fully carpeted. But the fun does not stop there. The flooring can be pulled up by a small rubber tab at the back, revealing this. Yes, Kyosho has painstakingly equipped this Skyline with a space saver wheel. It is fully detailed, and removable. Minute details like this make the model properly enjoyable to own. The interior is a delight to look at. The doors swing open smoothly with the right amount of resistance. The feeling is quite similar to Hot Wheels Elite models. The various small buttons are all painted with the appropriate icons. Even the electric window switches on the driver’s side door have been given the full treatment. The dashboard, door cards and centre console are all realistic to look at. And just have a look at those seats. The stitching patterns are sublime. But Kyosho was not done with the goodies. The front seats are able to tilt forwards all the way, just like an actual car. How many model cars can boast such a feature? Kyosho has given the Skyline the whole nine yards. That means that even the undercarriage is full of details. We can see even more wirings running from end to end. Various components such as the ATTESA E-TS all-wheel-drive system, suspension pieces and joints have been recreated with such realism. Conclusion? This is one of the best R32 Skyline GT-R models that money can buy today. It is easily on par with Autoart’s updated R32 offerings, with its plethora of details and unique added features. Best of all, it is criminally underpriced compared to them. I purchased mine for SGD$100, whereas an Autoart model goes for twice of that. There are different colours to choose from - wine red, white, gunmetal grey, and even a Japanese patrol car variant. However, do note of paint bubbling issues that may occur. Kyosho models are notorious for them, and this particular example has some very minor bubbling on some panels.